You don't have to reapply EVERYTHING, you know. Going out at night after a long day at work usually means we have to redo our makeup completely. But our friends from MAC Cosmetics say you don't have to do a full face, because there's a correct way to retouch your makeup to look super fresh! Best part? It takes two minutes. First, prep your lashes with lash primer before applying a coat of mascara. Then, with a stippling brush, gently tap BB Cream or a really, really lightweight liquid foundation (better if your foundation has a powder matte finish) on your T-zone and the apples of your cheeks. The reason? Those are the areas usually hit by light, so you're basically just highlighting and illuminating those features. 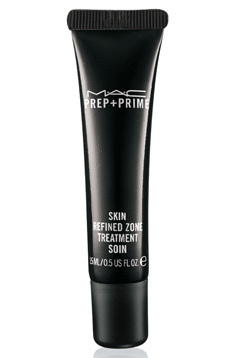 MAC has a tinted primer called the Skin Refined Zone Treatment Soin—a light, oil-free emulsion that helps mask pores, while coating your skin with a light tint so you look fresh even after a ridiculously long day at work. If you have more than two minutes, lightly tap on some blush on your cheeks, and apply a coat of lipstick. That's pretty much it!